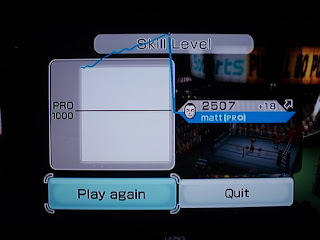 Is it possible to be too good at Wii Sports Boxing? Perhaps. They ran out of room on the chart! I float like a butterfly, and sting like a bee! When my wife saw me taking a picture of the screen, she let me know that I’m a loser. So I know this already. Woohoo! Won the football pool this week! Following two straight horrible weeks (one where I got the lowest score for forgetting to put my picks in), Eileen took charge and got 12 out of 14 to win the weekly pool. I’ve been lucky. I’ve been in this pool for about 8 years (man time flies) and I’ve won the weekly twice and the overall jackpot one year. Not too shabby.